The HETEMS programme is funded as part of the European Union (EU) ‘Clean Sky’ Joint Technology Initiative (JTI). The HETEMS initiative forms part of the System for Green Operations Integrated Technology Demonstrator (SGO-ITD) which is seeking to improve aircraft operation through management of energy and mission trajectory. The demand for this work and the use of Hybrid ElectroThermal-ElectroMechanical systems is driven by a desire to reduce power usage by Ice Protection Systems (IPS). In addition there is an increasing desire to use simulation over extensive testing to design IPS. The objective of the programme is to develop an integrated suite of tools to assess complex IPS, incorporating electromechanical and electrothermal systems, on 3D complex geometries such as wings in high-lift configurations and engine inlets. Wherever possible the HETEMS tool will make use of open-source software but will also include links to enable users to interface to other third party tools e.g. CFD solvers. 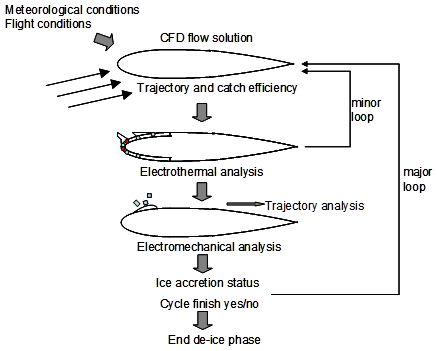 The HETEMS tool integrates a series of analysis modules together to create a closed loop simulation of an ice protection system in a representative environment. The tools are brought together under a Java NETBEANS Graphical User Interface (GUI) through which the entire simulation process can be controlled. 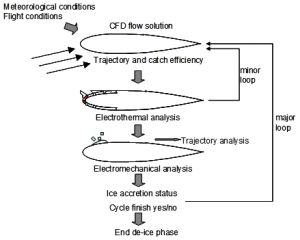 The analysis process is shown to the right. Traditionally, 2D IPS analysis tools have used fast potential solvers for analysis. These methods are, however, not appropriate for complex 3D geometries where localised separation can significantly alter the flow field and where ice accretions may cause flow separation. 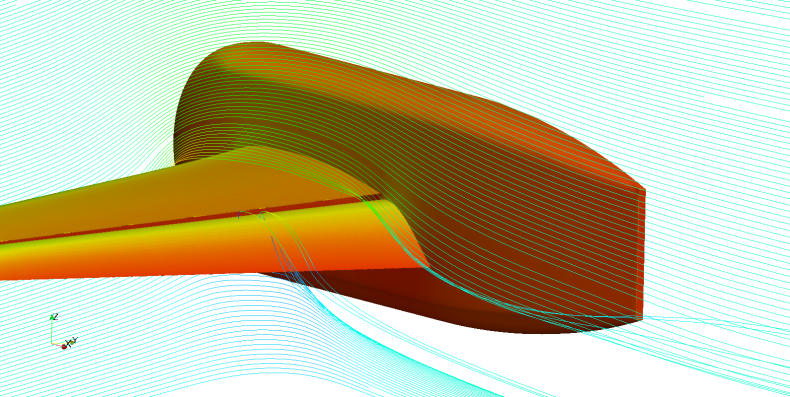 The OpenFOAM flow solver has therefore been selected as the preferred analysis code although interfaces to flow solutions from other codes will be supported. A typical complex geometry to be analysed is shown below. Streamlines across the HLPW body. The impingement of water on the surface is calculated as part of the Catch Efficiency analysis. This analysis calculates the volume of water impacting on the surface and can be analysed as a Lagrangian process, where individual particles are tracked, or an Eulerian process, where the flux of the droplet through the air is analysed. Once the water impingement is assessed the flow of the water needs to be simulated via a water film analysis process. The Thermal and ElectroThermal analysis requires thermal simulation of heater elements integrated into the structures, the structures itself, the ice/water accreted on the structure and heat transfer into the freestream. The thermal simulation is then used to predict the growth of ice on the body being analysed, as shown below. The open-source analysis dynamic finite element analysis tool IMPACT is used to study the break-up of ice due to electromechanical actuator activation. The simulation requires ice failure to be correctly predicted in terms of its non-linear behaviour and dependency on stress, strain and their associated rates. These electromechanical systems react extremely rapidly therefore the simulation durations tend to be short but require a high degree of resolution to capture failure correctly. 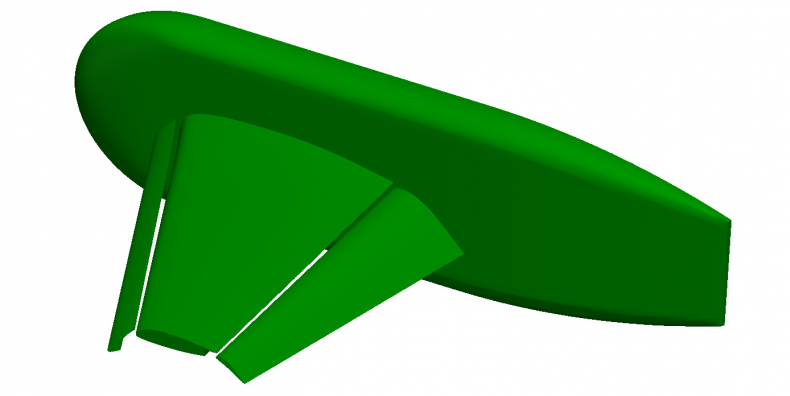 An example of an electromechanical analysis is shown below for an actuator on part of a wing. 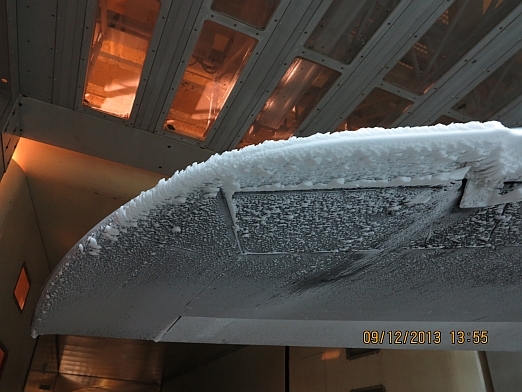 AeroTex UK, working with AleniaAermacchi, was responsible for the planning, execution and reporting of an icing test conducted on an ice protected wing section provided by Dassault Aviation, and implementing ice protection devices designed (and provided) by Zodiac Aerospace, as part of the SGO ITD, ‘HETEMS’ project. To control and monitor the ice protection system (a low power ‘Hybrid’ ice protection system, HIPS) a test bench was provided and operated according to a control law defined by Zodiac Aerospace. The test conditions were taken from the in-flight icing design atmosphere specified in CS-25 Appendix C. The Icing Wind Tunnel of the Italian Aerospace Research Center was selected to conduct the tests. The tests were successfully completed in December 2013. The individual tools have been verified against a series of tests cases taken from open-source literature.